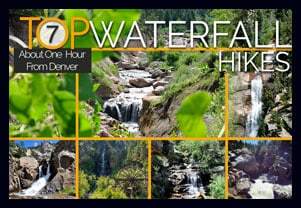 Looking for a trail that will provide some shade on a hot Colorado day? This hiking trail has shade, plus a waterfall, a stream, a canyon, and lake. It’s hard to beat. 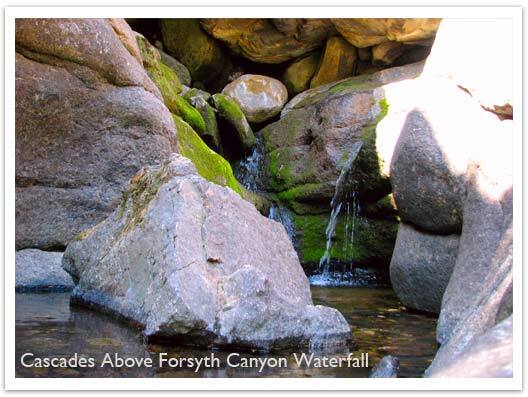 Forsythe Canyon is just outside Boulder, Colorado (1hr 15min from Denver), and is an easy to moderate hike. 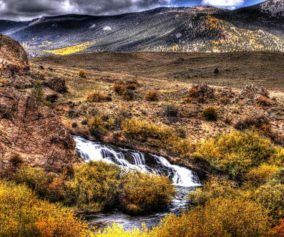 Check out our full hiking trail profile for details and be sure to read the directions to this trailhead carefully. 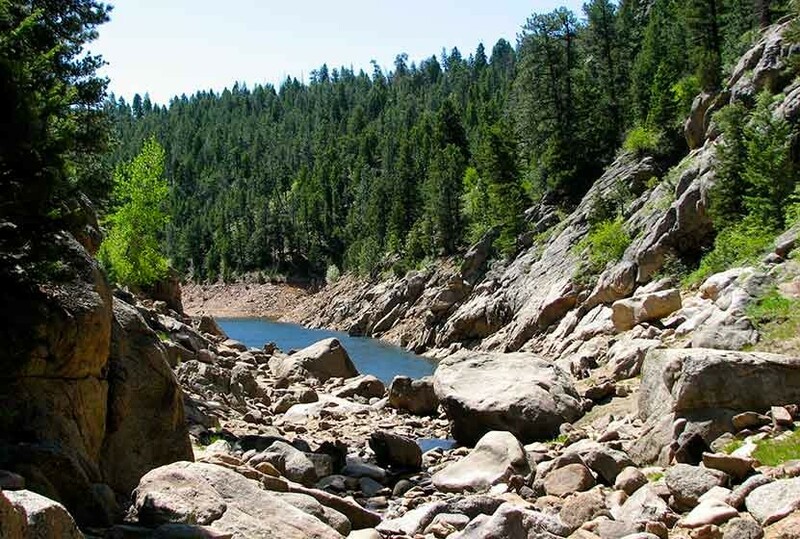 The shade of a wooded canyon, combined with a waterfall, ending at a blue lake, make this hike near Boulder Colorado worthwhile. Though it’s probably 25′ high, the waterfall is not what I’d call spectacular. 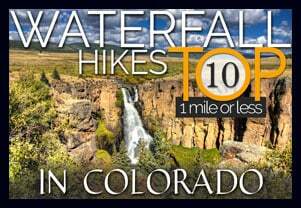 So, if you are going for this waterfall, I’d recommend going early in the season when the snowmelt is at its peak in May and early June. The trail winds gently downhill through a canyon, beside a creek, sheltered beneath fir and spruce. In fact, of the hikes we have profiled, this trail may provide more shade than any trail near Denver. You’ll come upon the falls about 1 mile into the hike and the reservoir is just 200 yards further down the trail. In fact, reaching the clear blue water was the highlight for our kids. We skipped rocks and hiked along the sandy and rock rim so that we could explore more of the lake. With the water levels being so low, and a large tree blocking the shot, I couldn’t get a good photo of the falls. One important note. The trail is a bit difficult to find just above the waterfall, in fact, if you take the wrong route, it appears to lead you down a rock face – which is not a good idea, especially with kids. 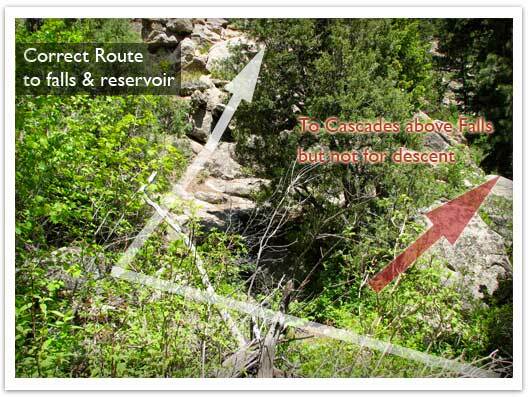 The correct route bears to the left of a cedar tree, will lead you up further above and away from the falls, then back down into the canyon floor. I’ve posted a photo below showing the juncture. Even in the photo, it’s hard to see the trail. TIP: If you are coming from Denver, it’s quite a drive. The payoff is that the parking lot was almost empty on memorial day weekend. 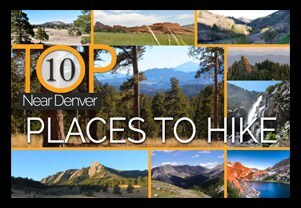 We recommend making a day of it and spending some time in Boulder before or after the hike. TIP: The Reservoir is stocked with Kokanee Salmon, and this stretch of it is where they supposedly like to hang out. So, bring your fishing gear. Here is a link to a Dept. of Wildlife PDF with information on the stock on the lake and some links to the fishing regulations for Gross Reservoir. TIP: Be sure to take the recommended route using Magnolia road. We’ve had a few emails from folks trying to reach the Forsythe Canyon Trailhead from Lakeshore Road. My understanding is that it’s not possible, or at least highly problematic. This was an amazing hike! Although the falls are dried up, the lake at the end is full of life, and the walk up is absolutely beautiful! Because it’s needing a little TLC, I would recommend this for mid level hikers, there are a couple of physical parts, but don’t let that scare you. It’s totally worth it! Me and the kids did this trail today 4-13-2013. It was BEAUTIFUL… and very few people. 8 and 10 year old did it fine. Near the end… you do have to climb over the rockpile to the left of the waterfall at the end… but it’s not as difficult as it looks. The trail down the valley was gorgeous and quiet… you pretty much follow a good sized brook/stream all the way down to the reservoir. We saw a recently deceased Bobcat on the trail near the end… that was sad, but cool. It was a GORGEOUS animal. This is an awesome hike! I just did it with a bunch of friends and we all loved it. For non-hiking folks like us it wasn’t too challenging but not too easy either. The scenery was beautiful and the length was perfect. It’s a little challenging just past the waterfall but that doesn’t last long. Definitely go all the way to the lake if you can, it’s worth it. Also, follow the directions closely nothing is well marked. Don’t plan on having cell reception either. My boyfriend & I just did this hike yesterday morning :) We arrived around 10am & were one of the only people on the trail. It was beyond beautiful! Definitely an ‘easy’ hike (we’re beginners and still felt it was easy), but it was relaxing and the lake at the end was certainly worth the 45 mins it took to get out there. 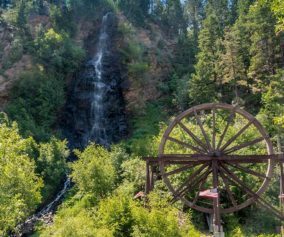 As everyone mentioned, the trail gets a bit confusing after the waterfall, but follow the instructions from this guide and you’ll figure it out. TIP: Bring your bathing suit & take a dip in the lake! The water is clear and not so cold in the summer. If you don’t go fully in, you can always stand in the sand near the shore to dip your toes! We arrived at the parking area today about the same time as 2 other groups. One was ahead of us, one behind. All of us went straight down the forest road #359 missing the trailhead. It is NOT well marked. It is near the parking area on the right of the left of the road before the road gate. Don’t miss it! We do NOT recommend the road which has many steep uphill sections and almost full sun all the way. It does go to the reservoir after about 3 miles we guess. We found the trailhead on the way back and will try another day. Since at least 3 groups of us missed it today, watch for it carefully. It wasn’t just us not paying attention. If you’re looking for a shady hike with very few other people, this is it! We saw around 6 cars in the parking lot, maybe 6 people, and 1 or 2 dogs. This is a pretty easy hike; I managed with a broken ankle (in a boot) and a 2 1/2 month old Aussie puppy. The trail gets a little rocky at times, and make sure to follow the directions above to go up and around the cedar tree near the falls. Also, when we were there we saw some mosquitoes and lots of yellow jackets around the stream and lake. That could have been a seasonal thing, but if you’re allergic at all, you may want to bring some Benadryl just in case. Not Necessarily Kid Friendly! I took my family on this trail on Sunday and we made it to the lake and back, and all in all it was an amazing trail. We chose this trail based on the review of being a perfect trail for young kids. Well my kids are 2 and 5, and I hiked with my 2 year old in a kid carrier pack on my back, and my 5 year old hiked the whole way. There are some places along the trail that can be very challenging for a child under 8, such as overgrown areas where you can’t even see the trail, large stumps and boulders you have to climb over, but most importantly the cliff area above the falls is very dangerous for the little ones to be near. 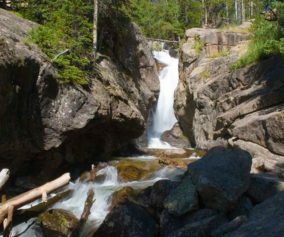 Once the trail gets to the top of the falls, you have to climb up a series of steep switchbacks up and over large boulders, while being very close to about a 40 or 50 foot drop near the falls. We made it up and over but were very cautious because of my 5 year old daughter. If I would have known about the cliff area part of the trail I probably would have looked for an easier trail for my kids. Don’t get me wrong, it’s not extremely difficult or anything, it’s just a bit nerve racking having a very young child that close to a fairly exposed drop off. 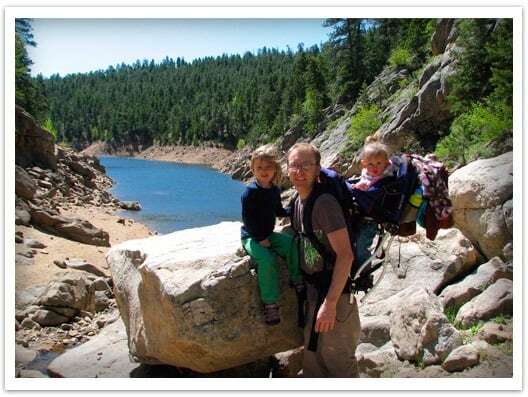 Thanks Mike, for the review and details on what it’s like to make the hike with kids. I’ve taken this one off the kid-friendly hikes page. I think it’s going to depend on the age of the kids, and how many adults you have with you on the hike to watch out for them. Hiked this trail today on 4/10/14. Well, actually missed the trail head and went down 359. It had beautiful views and we were the only ones there. Perfect weather today, but tough! The trailhead is easy to miss when you are eager to get going, make sure you watch for it. We will go back to try another time! great trail, hiked it last month and had a lot of people asking us where to go. I would be nice if the trail continued along the reservoir farther. The TH is not that hard to miss now, large pile of rocks and the classic brown marker, you will see it if you keep looking left along the road. I have a 6,5,4,3 year old and all love the hike very nice. Just did this hike this morning (7/22/14) and it was a lovely lovely day. Sunny, slight breeze, lots of shade. Very easy hike until the end, right by the waterfalls. The picture is good – I think the right words are ‘up and over’ that rocky spot. Sat on a rock ‘in the water’ and enjoyed watching the fishies swim around. Super clear water. It is a bit of a drive, last few roads are dirt/packed dirt roads, which was a bit of a surprise to me. Hiked this trail early in July and loved it. Like others have mentioned, not too challenging for the non-experienced, but challenging enough to make you feel like you’ve accomplished something! The drive up was a bit intimidating for non-CO drivers (ie mountains!) and the bit at the end is gravel/dirt. I was worried we had gone too far at that point. However, we had no problem finding the parking lot – thanks to your tips, probably! The parking lot was actually pretty crowded (it was maybe 9 or 10am on a Saturday) and the map there said the trail was 1 mile in/out. I guess they want you to stop and turn around at the waterfall? We, however, could see that there was a worn trail up and over the rocks, so we went a little futher before turning around. My point is… there aren’t very reliable maps or blazes and zero cell reception so be careful, and remember which paths you took! We took this hike yesterday and so glad we did! What a treat. A peaceful, sunny, comfortable light breeze kind of day in early August. Had the trail to ourselves the whole way out, took our time taking photos of the wild flowers, the stream and the waterfall. Took the path down to the rock face, definitely not safe with little ones, but us big kids had fun scrambling up and down the boulders. Only advice is to not miss the parking lot, we were following directions on iPhone and drove past it initially. Me and two of my friends were going to go down this trail today. We made a mistake that is very easy to make (as some other commenters have also made): We took the road instead of the trail. The trail will be on the left side just before the vehicle gate. The hike was still beautiful, gorgeous in fact, but it was definitely more than we bargained for at around 2.5 miles. This road takes you to all of the camping sites. We tried to tough it and find the hiking path through the forest, but it was impossible. The car trail takes you to a completely different part of the reservoir, and you can’t get back to the hiking trail, so don’t do it! Take a second to make sure you are on the hiking trail head. We plan on returning without all the idiocy the next time we make it to Boulder. This was my first time using this website and this hike was perfect. The detailed driving and hiking directions kept me on track. I had the trail to myself on a Wed morning and the drive alone is lovely enough to make the distance from Denver worthwhile. I’ll have to go back when it’s warm enough to camp. Great description of what to expect. Hiked this yesterday in the late afternoon so the sun coming down through the trees was not too hot and resulted in beautiful pictures. We went with two dogs, and most other dogs were not leashed. A bit of dog poo in bags on the side of the trail, but overall it was clean. There were lots of “which way do we go?” questions between hikers in different parties so asking and giving answers was very appreciated by everyone! This trail was busy on a Saturday and the parking lot was full so perhaps a weekday or an early start. Walking with the creek for most of the trail made for an enjoyable time! Don’t swim in the reservoir! A ranger came by on a boat and let us off with a warning, but it would have been a $50 fine. And he checked everyone’s fishing license, so be sure to have one if you’re fishing. Dogs are allowed to swim though, so not sure about the “it’s Boulder’s drinking water” reason for not allowing swimming. Besides that, awesome, easy hike. Nice and cool in the shade (90deg day in Denver) and the creek and waterfall were full from the snow melt. My husband and I are on our way to this hike today. Thought I’d leave the coordinates to the trailhead here for anyone using GPS. Just copy it into your phone and it’ll lead you to the correct spot. This was a great day hike. The trek to the reservoir after the falls was challenging with my twin 7 yr old boys but we’ll worth the climb. Wish we had a little better trail to explore more at the reservoir. Would like to of seen the whole thing. Google and Harold Sears say to turn left on Magnolia Dr – it is Magnolia Road – and says “Steep Mountain Road” as a warning. And it is. Clock the 6.6 miles to Rd 68 – we never did find it. Directions got me exactly to the parking lot from the site without a problem. Just took the hike today with my 8 & 9 year old. They hiked the trail no problem but they can hang on plenty more difficult. Pretty hike the whole way with the sound of the water all the way down the trail. Getting to the base of the waterfall was a bit washed out of a trail but was fun with clear water and some small trout to see. Reservoir was kinda dirty at the end of the trail where the stream meets up and couldn’t explore much there. Overall good hike! I did this hike last weekend (9/5/15) on a beautiful Saturday that was 80 degrees and sunny. We had no problem finding the trailhead with these directions, parking was good, there was a public restroom. The trail is well marked and it was a nice hike, easy to moderate. Here is something I want to address though; it says that this trail is dog friendly and while dogs are allowed I would never bring my lab here. The trail is almost all rocks & boulders, many places especially further down the trail are heaped rocks that you have to navigate over. It is very easy for a dog to get his foot or leg injured or broken going through these areas. There were many people on the trail with dogs and we did see one guy carrying his dog out from a foot getting wedged between rocks and twisted. I would discourage anyone from bringing a dog here for this reason. Other than that I would recommend this hike, there are tons of Aspens and I’m sure in the fall the colors are glorious. Just hiked this 6/21/16 – perfect hike for a hot day, but one recommendation: bring mosquito repellent! Until the breeze picked up, we all got bit like crazy. Definitely a beautiful spot and we’ll be back! Just finished the trail with my daughter. The extra hike down to the reservoir is worth it, don’t shortchange yourself! 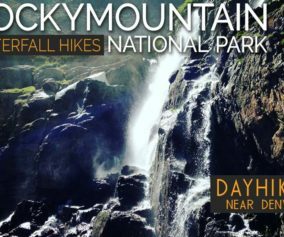 hiked this today 9/5/16, excellent hike! parking lot was packed but we found a spot and there were a lot of people and dogs on the trail but it still didn’t feel crowded. It sure felt like more than a mile each way but it wasn’t difficult. the bugs were nearly non-existent, weather was perfect. most of the trail-side stream was dry or at best a small trickle. the waterfall was also just a tiny trickle but I’m betting is amazing in snow-melt season. Like others above, i thought the rock scramble at the waterfall was the toughest part and even then not “tough” just nerve racking (especially with a 7yr old). we found the reservoir a little anticlimactic but we could see where it would be better when the water was up where it normally was. its down 20’+ based on the markings on the wall. the part we weren’t prepared for was the drive out. yes it was a steep climb up to the trail-head from Boulder Canyon road but our Tacoma made it up without complaint. the drive down was another matter, 5+ miles of steep 14+ percent down grade was more than we bargained for. Low gear doesn’t cut it on steep grades and hairpin switchback roads. Front brakes were smoking by the time we got down to boulder canyon road again. caution advised. Took this hike today. Like the most recent post besides mine, my brakes were also smoking by the time I got back to Canyon Rd. I would also agree that Magnolia route is really the only viable way in or out unless you’re in a pretty stout off road vehicle with HIGH clearance. I attempted to take this Lakeshore route out from the parking lot and did well to not bottom out or blow a tire in an F-150. Decided to turn around (easier said than done) and head back the way we came. As for the hike itself… it was great! Did it with my two older sons and they both loved it. There are a couple nice spots to do some small climbing along the way. We did the hike today on 1/7/18, and it was cool and windy… but with layers and the sun out it was fully enjoyable. We will be back for a camping trip without question. I would also agree with some posters that this may not be the easiest trail for small kids and dogs. While it can be done with either, there would be some pretty challenging sections with lots of loose rocks and poor footing. Don’t stop at the falls! Press on the the reservoir. It’s easy enough to find the trail… particularly with the directions and pictures above in the site. All in all, it’s a great spot and a fun hike. Just make sure your breaks are in good shape and pay attention to your surroundings. Directions were great. We were in a Ford Explorer. The kids commented: Driving up the mountain was really fun, the scenery was beautiful along the way. We even stopped at one of the scenic bypasses to see the roaring rapids. We did not encounter any bugs. The waterfall was really pretty, it was a fun hike. The stream was great that runs along the trails and the couple of wooden bridges were fun for the kids. The farm animals were out along the way as well so the kids liked that as well. It was great that people respected the trail and did not litter. Bring toilet paper for the bathroom and hand sanitizer/huggies. There was no toilet paper or we did not see a garbage can but people left the doggie bags up by the bathroom. There were lots of dogs on the trail my little one counted 16, they seemed to enjoy the fresh running water. The trail was relatively dry so our legs and shoes were dusty. The truck was also dusty from the dirt roads so we had to hit the car wash but it overall was an amazing hike! Thank you for the recommendations this was a great experience! We are visiting from out of state and I am wondering if someone can tell me if this hike will be accessible with our rental car. I know some of the roads can be challenging and require a four wheel drive vehicle. We would consider upgrading our vehicle to 4 wheel drive if many of the locations we are trying to get to are unattainable with something like a Toyota Corolla. Megan, if you follow the directions on this post (read the details), the drive will be accessible with 2WD vehicles. We drove there in our 2002 Jetta, which was pretty low clearance and it did just fine. However, as with all dirt roads, they can change drastically after very hard rains. We hiked this yesterday and thoroughly enjoyed it. Directions were to the trailhead were right on, and the trail itself was very lightly populated (despite the perfect weather and season), varied terrain, beautiful views. The photo included above–to lead you around the cedar above the falls–was REALLY helpful. I had skimmed over it the night before and then, when we reached that point, it suddenly came to mind. Lucky that, since we were sort of stupidly wondering if we’d reached the end or, if not, how we were supposed to get down the cliff. Thanks for the helpful tip!